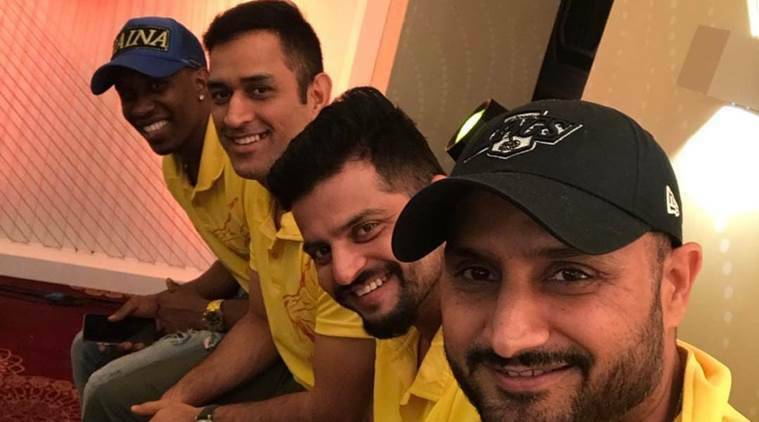 MS Dhoni, Suresh Raina, Harbhajan Singh and Dwayne Bravo enjoyed team dinner in Chennai after CSK won their third IPL title on Sunday. Chennai Super Kings on Sunday became the second team in the history of Indian Premier League to win the trophy for the third time. Riding on an emphatic batting performance from Shane Watson, CSK defeated Sunrisers Hyderabad by 8 wickets to win the cup. CSK mainstay and left-hand batsman Suresh Raina also posted a photo on Twitter. CSK made a comeback after facing a two-year ban. Dhoni has been a part of Rising Pune Supergiant in these two years and led them in 2016 edition while Bravo and Raina continued to share the dressing room as they donned Gujarat Lions’ jersey. Harbhajan was one of the new recruits in the CSK squad. Apart from the offie, CSK roped in Shane Watson, Ambati Rayudu, Shardul Thakur and Deepak Chahar. Harbhajan and Rayudu had served Mumbai Indians before joining CSK while Watson was a part of RCB. Shardul Thakur had played for Pune in 2017 and Chahar made his IPL debut with CSK in this edition. Watson and Rayudu were the top scorers for CSK in this IPL while captain Dhoni too played some crucial knocks during the tournament. SHardul Thakur was the most successful bowler for them.